Rounding off the Halloween recipes for this year with a timeless tasty classic. -Break the dark chocolate into small pieces and place in a bowl over a saucepan of boiling water stirring until melted. Do the same in a separate bowl for the white chocolate. -Push the candy sticks into the apples and empty the coconut flakes into a bowl ready for dipping. – Dip one apple into the dark chocolate ensuring it is full coated before dipping half way into the coconut flakes. -Dip the second apple into the dark chocolate ensuring it is once again fully coated. Pick up some if the white chocolate using a spoon and splash the white chocolate over the dark whilst spinning the apple. -Cover a plate with greaseproof paper and turn the apples upside down so the candy stick is facing upwards. Allow to set in the fridge. 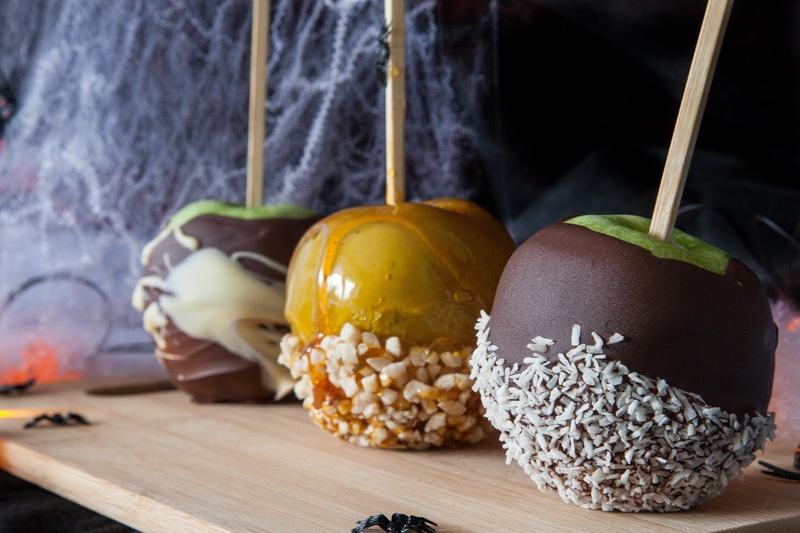 -Skewer an apple onto the candy stick. -Roughly chop your mixed nuts and place in a bowl. -Pour the sugar and syrup into a saucepan and cook on a medium heat stirring continuously to ensure it doesn’t burn. – Once the sugar has melted and turned a deep brown colour quickly dip the apple into the caramel ensuring its fully coated. – Dip the apple straight into the bowl of chopped nuts. – Place on the lined plate with the other two apples and leave in the fridge to set before enjoying.